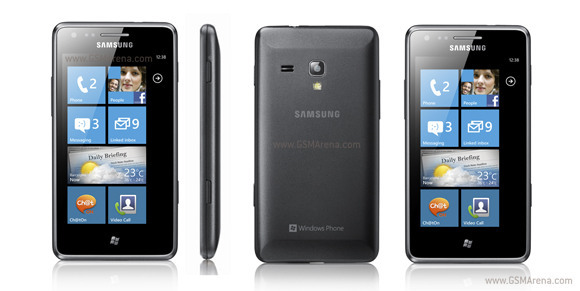 Samsung has just announced the I8350 Omnia M smartphone running on Windows Phone 7.5 Refresh. Oddly, the handset has the same model number as the I8350 Omnia W, but comes with different specs. Update:Samsung contacted us and cleared out the model number confusion. It turns out the I8350 bit was a typo and the Omnia M will actually have the model number S7530. The Super AMOLED screen on the Omnia M has grown to 4 inches instead of the 3.7 inches on the Omnia W, but the rest of the specs are somewhat dumbed down. There's 384MB RAM instead of 512MB and 4GB of internal storage instead of 8GB. Then the camcorder only shoots VGA videos instead of 720p ones and finally, the 3G HSDPA speeds now go only as high as 7.2 Mbps instead of the 14.4Mbps on the Omnia W. Yet, why those two share the same model name, remains a mystery. Perhaps Samsung is targeting a lower market niche with the Omnia M than the Omnia W, which currently retails for around €220. The Samsung Omnia M rollout will start from Europe and will then continue to other regions. Exact launch dates weren't mentioned, though. Unfortunately the only WP Device to have a card slot is the Samsung Focus.